Figure 1 : (a) Fraction of unique low clouds (2007-2010), according to space-based radar and lidar (CloudSat/CALIPSO) data (Kay and Gettelman 2009). (b) Deviation of mid-tropospheric (500-hPa) relative humidity from its mean over the tropics (30°S to 30°N), according to reanalysis data (1981-2010). First, we identify TLC regions as the 25% of the tropical ocean area (30°N–30°S) with the lowest mid-tropospheric (500-hPa) relative humidity (Fig. 1a, b). This gives moving TLC regions, in observations and in climate models, that follow regions of mid-tropospheric dryness. The regions in which monthly means meet the mid-tropospheric dryness criterion frequently broadly correspond to regions with frequent low-cloud cover, both in observations (Fig. 1a) and in climate models. We chose to identify TLC regions in this way to be able to follow low-cloud regions as they shift seasonally and under climate change—an effect that may be missed when considering fixed regions. Then we calculate the TLC reflection from the insolation and the amount of solar radiation reflected by clouds back to space. Space-based measurements indicate that on average 8.95% of the incoming solar insolation is reflected by clouds in the TLC regions. But the TLC reflection varies around this average with the underlying surface temperature. Our analysis of observations shows that TLC reflection robustly weakens when the underlying surface warms, for example, by -(0.96 +/- 0.22) % per Kelvin surface warming for deseasonalized temperature and cloud variations. In the intraannual, seasonal, and interannual frequency bands, TLC reflection likewise weakens robustly when the surface warms, and the weakened reflection arises primarily because the low-cloud cover decreases. Thus, observations point to a positive low-cloud feedback on warming. Figure 2 : (a) Equilibrium climate sensitivity vs TLC reflection feedback ( ) under global warming, inferred from differences between years 130–149 and years 2-11 of an abrupt CO2 quadrupling simulation (r=-0.73). (b) TLC reflection feedback under global warming vs deseasonalized reflection variations in CMIP5 models (r=+0.74). The models are numbered in order of increasing ECS. 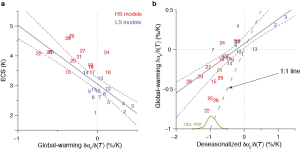 Models with ECS above the median in red; models with ECS below the median in blue. Dashed lines are 90% confidence intervals. The solid green line at the lower axis indicates the deseasonalized TLC reflection co-variation with temperature inferred from observations. The observations can be compared with what current (CMIP5) climate models produce. In simulations of the warmer climate reached after quadrupling carbon dioxide concentrations, higher-sensitivity (HS) models project a reduction of TLC reflection, whereas lower-sensitivity (LS) models project less change or even an increase. The models’ ECS correlates strongly (r=-0.73) with changes in TLC reflection (Fig. 2a). Additionally, changes in TLC reflection under global warming in the models correlate strongly with variations in TLC reflection inferred from temporal variations in simulations of the present climate alone (Fig. 2b). That is, as also seen in previous studies (Qu et al. 2014; Zhou et al. 2015), how TLC reflection covaries with temperature in simulations of the present climate is a strong indicator of a model’s TLC feedback under global warming. Figure 3 : (a) ECS vs the covariance of deseasonalized TLC reflection with temperature. The robust regression line (r=-0.67) and 90% confidence intervals are shown in gray. The green line at the lower axis indicates the deseasonalized co-variations inferred from observations. 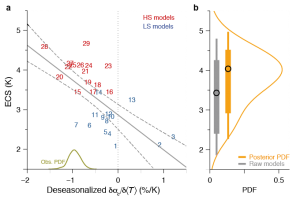 (b) Posterior probability density function (PDF) of ECS (orange) obtained by a weighted average of the climate models, given the observations. The bars with circles represent the mode and confidence intervals (66% and 90%) implied by the posterior (orange) PDF and the prior (gray) PDF. Because of the strong correlation between the TLC reflection feedback and ECS in models, these results imply that, remarkably, almost half of the ECS variance across models can be accounted for by simulations that do not involve any perturbation of the atmospheric greenhouse gas concentrations (Fig. 3). Therefore, we can use the covariation of TLC reflection with temperature obtained from observations of the present climate to constrain model projections of ECS. We estimate a posterior ECS from an average of climate models in which each model is weighted according to how well its simulation of the present climate reproduces the observed deseasonalized covariation of TLC reflection with temperature. This information-theoretic model averaging generally assigns greater weight to HS models because they are more consistent with the observations (Fig. 3a). It yields a posterior probability density function (PDF) of ECS with the median and mode at 4.0 K, and with a 90% confidence interval of [2.3 K;5.0 K] (Fig. 3b). That is, ECS most likely lies in the upper half of current estimates; values below 2.3 K are very unlikely. Of course, these posterior ECS estimates are still conditional on the range of ECS simulated by current climate models. They merely indicate which ECS in the model range are more likely than others, given the observations. They do not rule out ECS entirely outside the range indicated by current climate models; all models may be wrong. But accepting the climate models as our currently best representation of the climate system, the observations unmistakably point to higher ECS being more likely, and a substantially higher ECS than previously thought as most likely—though the range of possible ECS obtained in this way is still wide, still indicating large uncertainties. In our paper, we also investigate how other environmental factors besides the surface temperature may influence TLCs. Recent articles have highlighted the inversion strength as a factor controlling cloud cover (Qu et. al 2015a, Myers and Norris 2016). Using a bivariate regression to quantify the influences of both surface temperature and inversion strength on TLC reflection, we found that temperature exerts the primary control. Estimates of the TLC feedback on warming and of ECS are not substantially affected by including inversion strength as a predictor in the analysis. Thus, our results robustly indicate that TLC reflection of sunlight feeds back positively onto warming. They also point to higher ECS within the range simulated by current climate models as being more likely. The consistent covariance of TLC reflection with surface temperature on timescales from seasonal to interannual and under global warming in climate simulations indicates that temperature is a key factor controlling TLC cover, and that similar processes likely govern the TLC response to warming across the timescales. So a process-oriented analysis of low-cloud variations in the present climate has the potential to lead to improvements in the representation of the low-cloud response to climate changes in models. Such as process-oriented analysis can also shed light on the mechanisms responsible for this low-cloud response—a crucial question our paper leaves unanswered. It is a very nice paper and the results seem to me very robust. I particullarly like your arguments on the surface-tempeprture (Ts) control of tropical low cloud, which implies basically the variation of TLC follows the same relation with Ts on interseasonal, interannual, decadal scales or under CO2-induced climate change. But we know that the mechanisms responsible for the variation of Ts are different in internal variability on these time scales and in forced climate change, then my questions is that: is it possible that the spread in ECS might not be so directly caused by low-cloud feedback, although the low cloud feedback is a very good indictor for the model uncertainty? Thanks for the comment! You are right that the mechanisms responsible for the variation of surface temperature are different for internal variability and for climate change, and this can indeed affect the cloud response (e.g., inversion strength varies differently in natural variability and global warming). As with all emergent constraints, this means it can be difficult to use natural variations to constrain the climate response of clouds. What justifies our analysis is that in the climate models, the strength of the TLC response to natural temperature variations (on timescales longer than a year) correlates strongly with the response to global warming, and it also correlates with ECS. By contrast, for example, the TLC response to changes in inversion strength does not seem to account for much of the differences among models. This suggests that at least in models, similar mechanisms may control the response to natural temperature variations and forced variations. But what remains to be done is to establish and quantify the relevant mechanisms. We also know that the representation of TLC processes in climate models is semi-empirical and uncertain. Given that the ECS in models correlates very well with the strength of the TLC feedback, it seems reasonable to attribute a large fraction of the ECS spread to the TLC feedback.